Author 5.0 (a big round number) will feature the current pinch in to collapse to (improved) TOC and pinch out to create a Dynamic View. In the future the user will also be able to create in-document Dynamic Views at the point of insertion through cmd-d or ctrl click and choose Insert Dynamic View. This document described both types: Document and In-Document. The aim of this mode is to help the user have the means to mould the information they find and generate into a coherent whole, both to communicate with others and to help them grasp the information and to see what is missing and what is contradictory. In order to build such a structure in a visual way, the user needs self contained units/nodes which can be placed freely on the screen and possibly connecting lines and/or headings to categorise the nodes. These nodes need to represent the information the user would like to see and move. A way to reconcile the different kinds of nodes the dynamic view can show can simply be to let them all be possibilities for the user. The user sees the dialog shown below on first entering a new dynamic view. This dialog will further be shown on double clicking on the desktop/background in the dynamic view or via cmd-shift-d.
To return to the word processing view the user pinches in or cmd-d (in the menu under View/Dynamic View). In the document view a ‘screenshot’ representation of the view will be shown. This is not an actual screenshot but a live diagram scaled to fit the width of the document with all contents so the size of the text will be determined by how far apart the nodes are. To re-enter the view user pinches out when in word processor view, double click on screenshot representation of the dynamic view or pinch out and the Dynamic View closest to the cursor will expand. If a Dynamic View is copied (cmd-c to copy in this view copies the full view, to move into another part of the document) and pasted into a different document, links should still work, so we will need between-document local links. The user can cmd-click to add more than one or shift-click to add a range, as normal Mac selections, or even cmd-a to select all of a type, such as all Headings. The Heading tab shows all headings in the document, Glossary Entry shows all glossary entries on WordPress, Citation shows all cited work in the document and Plain Text simply provides a text entry field plus a URL field to add an external link (user can also select Plain Text later and add a link through cmd-k). In the dynamic view Headings would have their style and all others would have body font plus Plain Text slightly grey, Citations in italic and Glossary Entries as plain text. 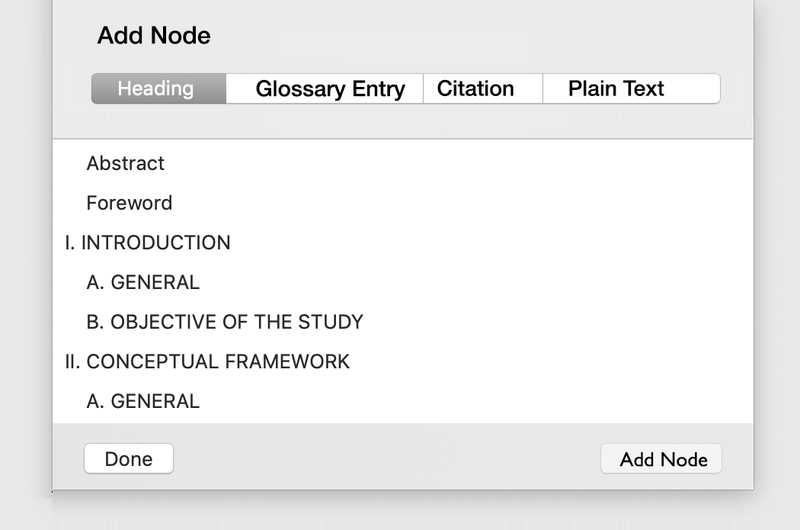 In the Dynamic View the user can add a Heading Glossary Entry, Plain Text and maybe citation which does not yet exist in the word processing view. To do this the user will click on a ‘+’ icon at the top of each category in the dialog shown above. Maybe. We should also have a brainstorm mode to quickly add many of whatever last category. Maybe cmd-double click on the background and cmd-shift-d? In the Dynamic View double clicking on a node jumps to whatever it is linked to it-if nothing then it simply enters that node. Click to hold and move. Click and drag onto other for line and option click for line with arrow. This is in line with Scapple interactions.